2018: Record high in the number of Jews murdered in anti-Semitic attacks, 70% of anti-Jewish attacks anti-Israel in nature. 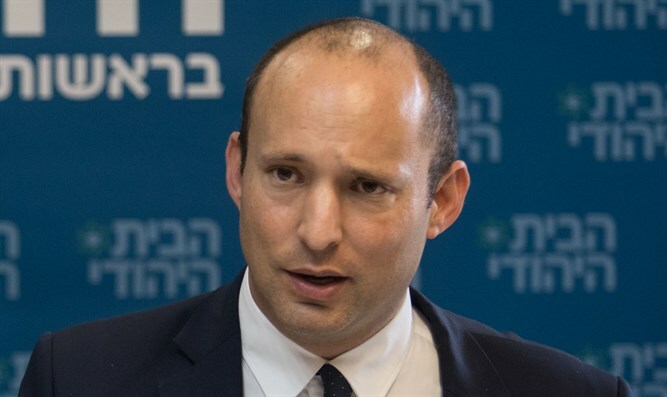 Marking International Holocaust Memorial Day, Israel's Minister of Diaspora Affairs, Naftali Bennett presented at the weekly Cabinet meeting on Sunday morning the 2018 Global Anti-Semitism Report, with which details worldwide trends, and highlights key initiatives of the Ministry to combat and monitor anti-Semitism. Minister Bennett commented on the report, "The State of Israel is a strong and secure country, a super power in the fight against terror, and it is our responsibility to help the millions of our brothers and sisters in the Diaspora who are facing more and more anti-Semitic crimes." He added, "The year 2018 saw record highs of anti-Semitism in the streets, online, and in the political arena, around the world. It is a year that saw the highest number of Jews murdered in anti-Semitic attacks since the 1990s, in three separate attacks. The Ministry of Diaspora Affairs will continue to work to build bridges with Jews around the world, and to eradicate antisemitism through legal, diplomatic and public diplomacy channels. Especially this week, when the world marks International Holocaust Memorial Day, I call on governments around the world to act: rid your societies of anti-Semitism, and take a harsh stance against the hatred of Jews." 1. In 2018, 13 Jews were murdered in 3 fatal anti-Semitic attacks. This marks the highest number of Jews murdered in anti-Semitic attacks since the attacks on the Argentinian Jewish community in the 1990s. 2. Record high levels of anti-Semitism on the streets and online. Around 70% of anti-Jewish were attacks anti-Israel in nature, while the height of incitement was recorded around the transfer of the American embassy to Jerusalem and the Hamas led "march of return" riots at the border fence with Gaza. 3. Unlike previous years, anti-Semitic violence in 2018 was led by neo-Nazis and white supremacists. 4. In France, after a noticeable reduction in anti-Semitic attacks in the previous year, due to a change in government policies and security deployment, there was a rise in 69% in anti-Semitic incidents. 5. In the United Kingdom, anti-Semitic incidents have reached an all-time recorded high; anti-Semitism in the Labour Party has seen significant numbers in the Jewish community express deep concern for their future in the country. 6. A survey conducted by the European Union shows that 85% of European Jews believe that anti-Semitism is a problem in their countries, 89% believe anti-Semitism has increased in their countries over the last five years, and 38% have considered or are considering emigrating as a result. The survey also showed that 80% of incidents were not reported to authorities. 7. The definition of anti-Semitism as defined by the IHRA (International Holocaust Remembrance Alliance) has become an international standard for judging antisemitic expressions and acts. The definition was adopted by 6 further countries this year, meaning it has now been ratified to date by 12 countries: Israel, Britain, Austria, Scotland, Romania, Germany, Bulgaria, Lithuania, the Republic of Macedonia, the Netherlands, Slovakia and Moldova.